The weather yesterday was great; sunny but not too hot; just what I’d expected from an English summer. Today we had islamic weather… slightly sunni but mostly shite! Apparently the forecast is for a change back to sunny next week. Richard and James made a start on the high galley cabinets whilst my first job for the day was to thoroughly clean the back cabin in preparation for varnishing. After giving all the bare timber a light sand followed by a wipe down, I applied one coat of varnish diluted with 10% white spirits. Whilst the varnish was drying I did some tidying of the media wires in the TV compartment. The cables for the six ceiling speakers have been sorted and clipped in preparation for connecting to the TV. I’ve also mounted the three way terrestrial TV splitter and clipped the coaxial cables. 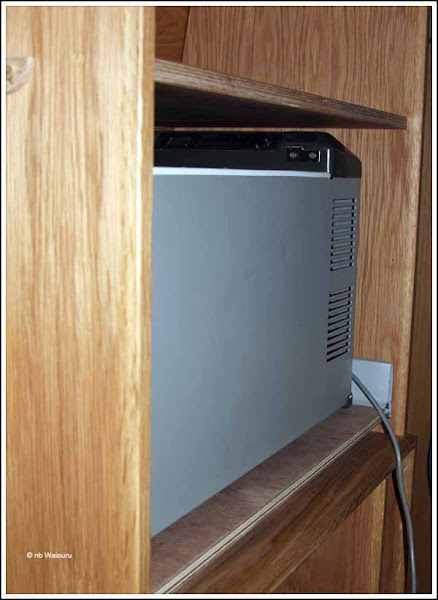 The coaxial runs from an input mounted high in the cratch to the 12v amplifier in the TV cabinet. From there the coaxial goes to the splitter. The three outlets go to: the small TV in the bedroom; the media tank; and the main TV. I’ve run an additional draw wire from the ceiling into the TV cabinet as we may need to install a satellite coaxial cable at some future date. 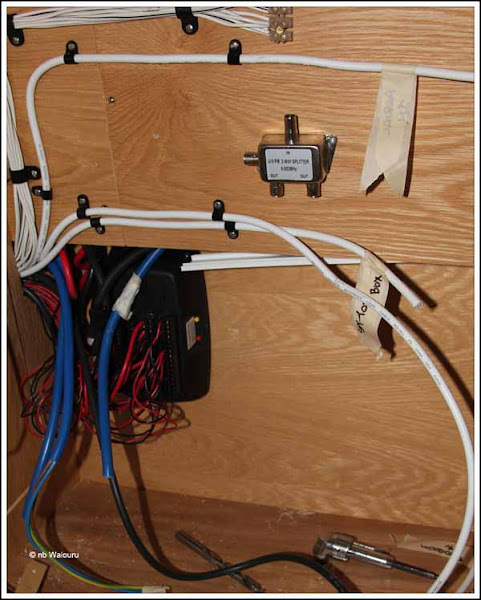 The outstanding task is to finish the 240v wiring to the outlet sockets along with the 12v DC supply to the TV amplifier. 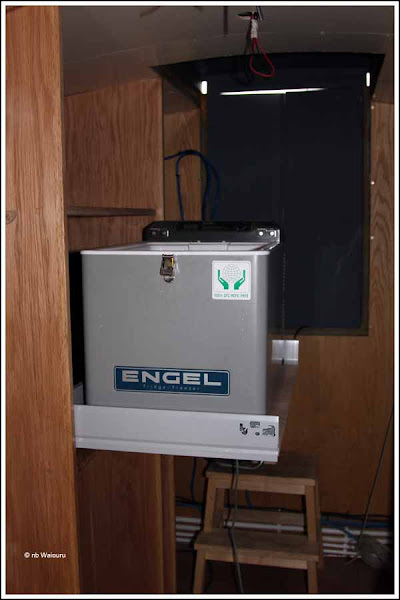 Whilst the freezer compartment hasn’t been completed, I decided to place the Engel freezer on the sliding drawer. The front to the drawer hasn’t yet been made but by placing the freezer in the drawer it gets it out from under our feet. At the moment it’s still running on 240v, however when the Empirbus system is commissioned I’ll wire it into the 12v system. I’ve already thought of ventilation for the freezer when the drawer is closed. There are a row of 1¾” holes across the base of the compartment at the rear which allows cold air to rise from the washing machine underneath. I’m going to drill a horizontal row of high holes between the freezer compartment and the wet locker to its right. Hopefully the warm air generated by the freezer will assist in drying any wet clothing in the locker. That reminds me…..the design of the wet locker is something that needs attention! Ho, ho, but I'm afraid you'll find that that's really unacceptable humour in the UK, even if it might be OK in Oz. Your information is so informative. Being PC is sooo yesterday Brucie Baby.